(Bloomberg) -- With all risk assets in green in 2019, the rally is showing no signs of fatigue. 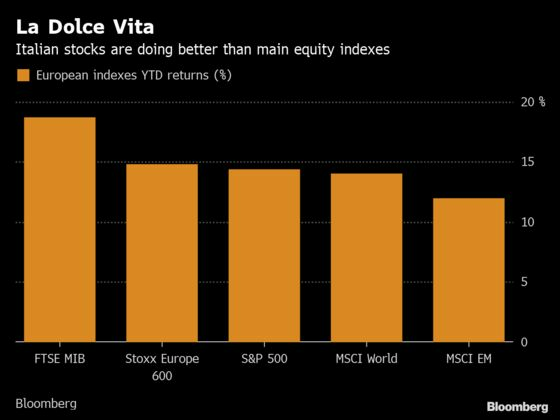 Even Italy, a country that caused deep concerns for Europe last year, is now in a bull market. In fact, the FTSE MIB is by far the biggest gainer among main equity indexes in the region. It’s something to watch, with European elections around the corner and the recent budget standoff with the European Union. The country has benefited from a series of positive events, including some cracks in the coalition, easing tensions with Brussels over its budget, and an unchanged credit-rating at Fitch in February. The bounce in its PMI data yesterday was the cherry on the cake, fueling hopes that the current economic downturn will be short-lived. Interestingly, the strong weighting of financials in the FTSE MIB (35 percent), Europe’s highest after Spain’s IBEX, didn’t act as a drag this year. On the contrary, Italian lenders rebounded sharply after they were sold off in 2018. 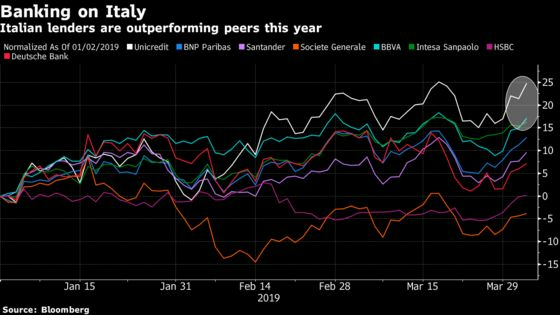 UniCredit, Italy’s largest bank, is up 25 percent, outperforming peers. It’s still an analyst’s favorite, with 88 percent of buy ratings and no sells among the Bloomberg consensus. The bank will be in extra focus today following a Financial Times report it is readying a bid for Commerzbank AG in case talks to merge the German lender with Deutsche Bank AG collapse. 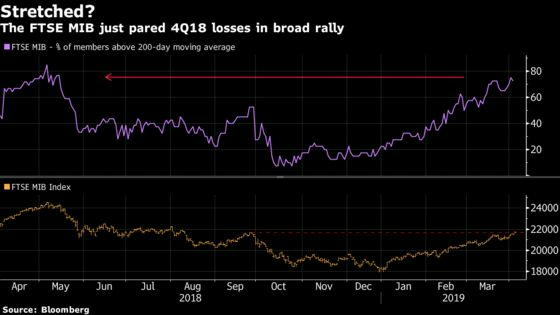 By contrast, Ferrari, which has a 4.5 percent weight in the index, has seen its stock soar 40 percent this year and is trading above the average Bloomberg consensus price target. Overall, the country’s share-price strength can’t be taken for granted. Italian politics remain worrisome, and fundamentals are still weak, while the fiscal situation is fragile, Barclays strategists including Emmanuel Cau said in a note this week. 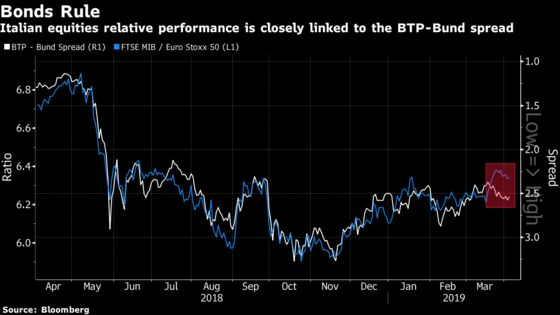 The dislocation between the BTP-Bund spread and the relative outperformance of Italian equities could also point to caution. Even with easing budget-related tensions with the trading bloc, the country’s stance is unlikely to change, keeping anti-EU rhetoric during the election, while avoiding full confrontation, Barclays said. This may not mask Italy’s current problems as it grapples with weak economic activity, the highest debt-to-GDP ratio of the euro zone after Greece, while struggling to keep the budget on track. 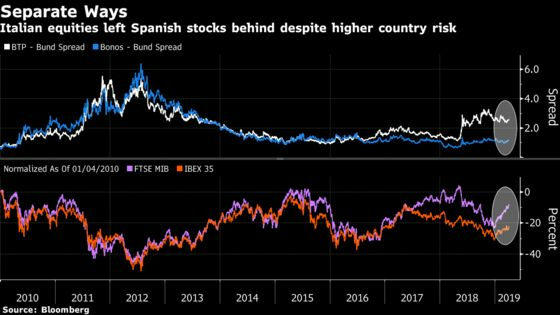 Looking for southern-Europe exposure the strategists prefer Spain, where fundamentals are healthier. Technically, signals are starting to look a bit stretched too. Within the market breadth of the FTSE MIB, 90 percent and 68 percent of stocks are trading above their 50-day and 200-day moving average, respectively. With 30 percent of components in overbought territory, Italy has one of the highest proportion of overbought stocks in Europe. After the U.K. Parliament voted to block a no-deal Brexit, the pound is marginally higher and FTSE 100 futures are down 0.2%, while Euro Stoxx 50 contracts are trading down 0.1% ahead of the open. Watch the pound and U.K. stocks after Parliament voted to block a no-deal Brexit, sending the pound higher by removing at least some of the jitters around that risk. More talks are expected between Prime Minister Theresa May and Labour’s Jeremy Corbyn, while more ministers resigned. Watch Brexit-sensitive sectors housebuilders, commercial-property, domestic lenders, retailers and U.K. government contractors. Watch banks following a report that Italy’s UniCredit is preparing a rival bid for Germany’s Commerzbank should the latter’s merger talks with Deutsche Bank fall through. Watch the three banks involved plus any reaction in the rest of the banking sector. Separately, UBS is said to be considering options for its asset management arm, including potentially merging it with Deutsche Bank’s DWS and then combining the pair into a separate spin-out. DWS has already attracted the interest of Allianz. Watch oil and oil companies after the commodity sputtered a little on Wednesday as U.S. crude inventories and output spoiled a rally driven by OPEC supply cuts, though this could well return. Citi cuts Micro Focus to sell (PT 1,700p) from neutral and U.K. software peer Sage to neutral (PT 720p) from buy, citing valuations. Also sees downside risk to Micro Focus’s revenue forecasts and Ebitda growth versus expectations; says the stock is mis-pricing free cash flow profile. For Sage, sees limited scope to drive revenue growth forecasts higher in the near term, and while demand for SME software remains supportive long-term, sees modest headwinds on horizon. Berenberg initiates Husqvarna with a buy rating, saying the company has a leading market position, trades at discount to peers and historical average, and its group restructuring is expected to lift margins. PT is set at street-high SEK105.